In anticipation of the LIVE Fieldbook mobile app, the wqdatalive.com Fieldbooks have been completely redesigned. The new design makes the web version more consistent with the app’s layout and uses a universal interface for a more unified cross-platform experience. The new layout consists of a two-page, side-by-side view much like that of an open notebook. Pages can now only contain one module type (note, picture or form) giving each page more focus and a cleaner look. The page information like date, time and location has been put into an info box to keep things organized and easily accessible while still keeping pages uncluttered. The location system has received many updates and will continue to receive more going forward. Whenever a new site is added to a project, a new location will be made as well. These locations will not be editable within the location manager but will update their name and GPS coordinates when the corresponding site is edited. The location manager now also allows choosing locations from a map instead of typing in the coordinates. This should make adding new locations and selecting existing locations for pages a breeze. The last major new feature is the page selector. Now, instead of typing in a page number to quickly jump back to an old page, a scrolling list of page thumbnails can be brought up. Then, with a quick glance, the desired page can be found and opened. This will also make way for a future update to add the ability to flag or bookmark pages in a Fieldbook. 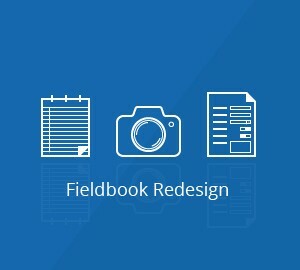 The ability to display drawings or handwritten notes in a Fieldbook has also been added to the site. Currently creating drawings or handwritten notes can only be done through the mobile app, which will be released soon. This is a much anticipated feature and we are looking forward to releasing the app and unlocking the full potential of a mobile, digital field notebook.